Interpreting snow depth records from past decades is as much art as science. Even into the 1990s, Soviets on Arctic drifting sea ice used meter sticks and handwritten logs to record snow depth. Today, things are a lot more accurate. Airborne measurements are validated by researchers on the ground using automated probes similar to a ski pole. Accuracy is important. The public has become concerned about what is happening at the poles, and so research led by NASA and the University of Washington combined data collected by ice buoys and NASA aircraft with historic data from ice floes staffed by Soviet scientists since the late 1950s through the early 1990s to track changes over decades. They confirm that snow has thinned significantly in the Arctic, particularly on sea ice in western waters near Alaska. On using probes, "When you stab it into the ground, the basket move up, and it records the distance between the magnet and the end of the probe," said first author Melinda Webster, a University of Washington graduate student in oceanography. "You can take a lot of measurements very quickly. It's a pretty big difference from the Soviet field stations." Webster verified the accuracy of airborne data taken during a March 15, 2012 NASA flight over the sea ice near Barrow, Alaska. The following day Webster followed the same track in minus 30-degree temperatures while stabbing through the snow every two to three steps. The authors compared data from NASA airborne surveys, collected between 2009 and 2013, with U.S. Army Corps of Engineers buoys frozen into the sea ice, and earlier data from Soviet drifting ice stations in 1937 and from 1954 through 1991. Results showed that snowpack has thinned from 14 inches to 9 inches (35 cm to 22 cm) in the western Arctic, and from 13 inches to 6 inches (33 cm to 14.5 cm) in the Beaufort and Chukchi seas, west and north of Alaska. That's a decline in the western Arctic of about a third, and snowpack in the Beaufort and Chukchi seas less than half as thick in spring in recent years compared to the average Soviet-era records for that time of year. It's hard to know for sure because while NASA measurements from 2009 are accurate, handwritten Soviet logs are not going to have the same credibility. "Knowing exactly the error between the airborne and the ground measurements, we're able to say with confidence, Yes, the snow is decreasing in the Beaufort and Chukchi seas," said co-author Ignatius Rigor, an oceanographer at the UW's Applied Physics Laboratory. The authors speculate the reason for the thinner snow, especially in the Beaufort and Chukchi seas, may be that the surface freeze-up is happening later in the fall so the year's heaviest snowfalls, in September and October, mostly fall into the open ocean. What thinner snow will mean for the ice is not certain. 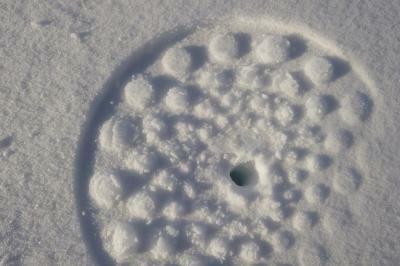 Deeper snow actually shields ice from cold air, so a thinner blanket may allow the ice to grow thicker during the winter. On the other hand, thinner snow cover may allow the ice to melt earlier in the springtime. Thinner snow has other effects, Webster said, for animals that use the snow to make dens, and for low-light microscopic plants that grow underneath the sea ice and form the base of the Arctic food web. The new results support a 15-year-old UW-led study in which Russian and American scientists first analyzed the historic Arctic Ocean snow measurements. That paper detected a slight decline in spring snow depth that the authors believed, even then, was due to a shorter ice-covered season. 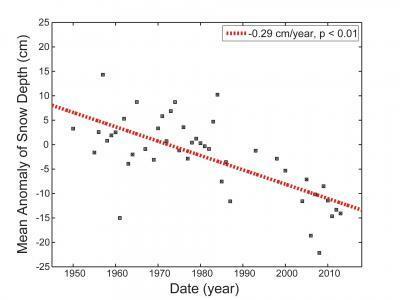 "This confirms and extends the results of that earlier work, showing that we continue to see thinning snow on the Arctic sea ice," said Rigor, who was also a co-author on the earlier paper. The recent fieldwork was part of NASA's Operation IceBridge program, which is using aircraft to track changes while NASA prepares to launch a new ice-monitoring satellite in 2017. The team conducted research flights in spring 2012 as part of a larger program to monitor changes in the Arctic.